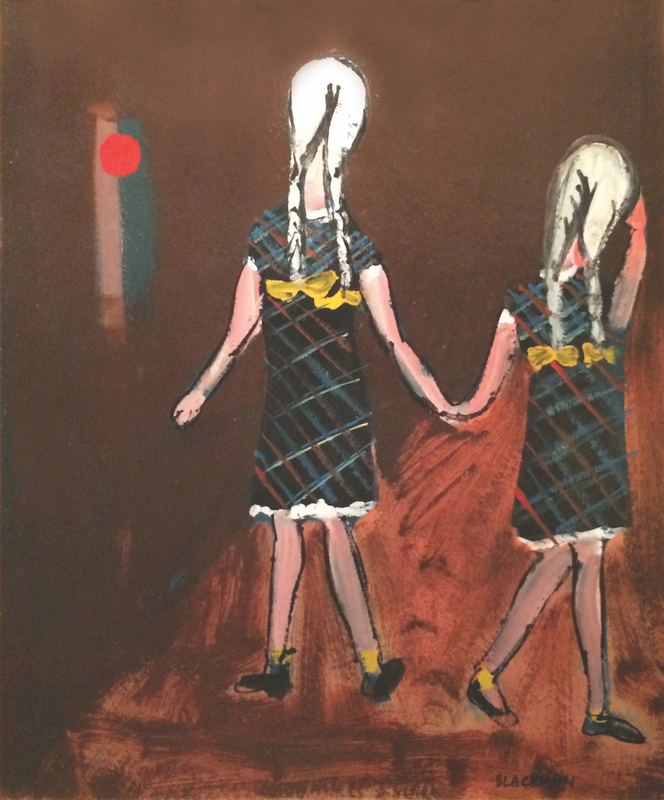 Sisters at the Crossing is quite a large painting and comes very early in the first Schoolgirls series[i] and, although it was not exhibited in the Peter Bray exhibition, it relates to a number of paintings in that show including The Sisters, In the Street and The Friends. It is one of the most haunting and disturbing paintings in the series. Two schoolgirls girls in matching dresses with long plaits and matching yellow bows are seen from behind; their attention and the attention of the viewer are completely galvanised by a brilliant and luminous blood-red blob in the distance. The title suggests that it is the red light at a street crossing, although there appears little space for an amber or green light. The children appear arrested in space with their spindly limbs awkwardly spread against the picture plane. Sisters at the Crossing is permeated with a haunting presence as the two anonymous schoolgirls appear trapped within a claustrophobic space with just a touch of the sinister – it is an encounter of innocence with a world in which danger lurks and there is an oppressive feeling of unease. The splashes of red as part of the pattern of the dresses heightens the sense of impending violence. [i] Although very little actually happens in the painting, the sense of anticipation is immense and the suspense is palpable. This is a key painting in a series that was to define Blackman as an artist.